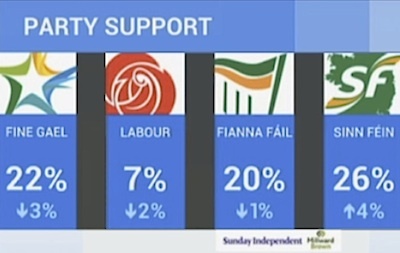 Ireland is on the cusp of enormous political change. Our homegrown political establishment, who have defended their interests against all comers since the foundation of the state, suddenly find themselves wrong-footed and floundering. Nothing seems to be working like it used to. Voters are not mollified by lower taxes on pints or cigarettes. Instead angry water charges protests fill the nation’s streets, and the sense of crisis is accelerating, not slowing down. When your political instincts have been shaped by a familiar system, it’s disconcerting when your old responses fail to work. But that’s where we are now, in the weirdly calm moment between large numbers of Irish citizens deciding the old ways have stopped working - and the moment when they finally do something radical in response to it. Irish political parties are instinctively conservative; they hate change because it’s unpredictable. But suddenly they are being confronted with an electorate so furious that they are contemplating the unthinkable: change. It’s such a little word. And it has rarely been a distinguishing feature of Irish political life. Through each endless recession, each biting budget, and each wave of widespread emigration our political class kept their heads and their positions. Shockingly, all that complacency has evaporated since 2010, affording us a good look at where we are. Now, thanks to the banking collapse and the punishing austerity that followed, the traditional Irish social compact has been bent to the point of snapping. Bone deep cuts have been made to social welfare as high-flying multinationals enjoy two percent tax rates, but the issue that galvanized the Republic as rarely before in its history is anger over water charges. Almost 100 protests were held nationwide last week over the latest austerity measure in the government’s plan to pay back the international financial bailout the state had to seek in 2010. The current Fine Gael and Labour government is clearly taken aback by the sheer scale of the protests, which they know could destabilize their leadership. Trying to get ahead of the iceberg they offered to negotiate some unspecified relief packages. It’s unlikely to be enough to save them however, because there’s an unmistakable sense of a national awakening driving the latest protests. That’s a development that our traditional parties are completely unnerved by. Change is unpredictable. It explains why there’s been more than a hint of panic and hysteria behind the anti-Sinn Fein media coverage that’s clearly intended to see off the threat to the Republic’s longstanding political system. Story after story intended to harpoon the party and its leader Gerry Adams has simply not stuck. Indeed 6,000 Irish people have voted with their feet joining Sinn Fein in the recent past. The Sinn Fein opponents may have failed because the intention of dismantling or neutralizing the rise of Sinn Fein has become so obvious. Irish people do not like to be told what to think, but in their increasing panic and desperation our political parties have decided that now is not the time for subtlety. The Irish political model worked for decades. Private schools run by the clergy educated our high flying leaders, trained them in the traditional sports, and then opened the doors to business and industry. Young men found themselves inheriting longstanding political dynasties. They grew to maturity in the warm embrace of a community and culture. They learned what to say and how to say it at social gatherings. The complacency was so complete it was insuperable. It could withstand any challenge because there appeared to be no alternative. Irish politics was not national it was parochial. Your crowd and community would return you to power, regardless of your performance, and often in spite of it. Meanwhile far away in the North, beyond anyone’s notice, a left wing political model was being developed that no one in the Republic’s political circles saw as a threat. For decades that left wing model existed in the political wilderness, to be dismissed when it was not being scoffed at. But no one in Dublin is scoffing at it now. Sinn Fein has always played a long game, but cannier still it has played a national one. It has always looked beyond the townlands and parishes to the fate of all thirty-two counties. No party in the Republic has seriously done likewise since the 1920’s. Now Irish voters are in the mood to hit the national reset button on what more and more people see as a failed state. The banking crisis shattered the Irish social fabric and in Ireland the social fabric is the most important thing of all.